Kahtoola MICROspikes Ice Cleats. Lighter and tougher, the new MICROspikes deliver unrivaled traction on icy winter trails. 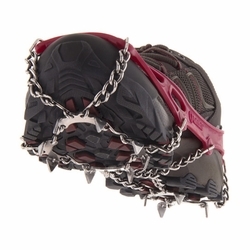 MICROspikes traction is tough enough to handle any adventure with stainless steel spikes and welded chains. MICROspikes now feature an integrated toe bale and reinforced eyelets allowing for a 50% lower profile elastomer harness. The MICROspikes feature a lower profile elastomer harness, thanks to Kahtoola's Patent Pending eyelet reinforcements and integrated toe bale. They also now include welded chains, and continue to boast complete stainless steel construction for all metal components. All of these improvements have resulted in an elastomer harness with a 50% lower profile, and a 13% total weight reduction over the previous MICROspikes. A Tote Sack is included with each pair of MICROspikes. FOOTWEAR NOT INCLUDED. NOT FOR TECHNICAL CLIMBING.